Thursday gloomy evening... Nothing to do... I have to improve my mood and relieve some stress. 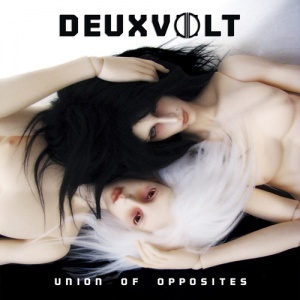 While flicking through my files library I found something fresh – Deuxvolt – 'Union of Opposites' – a first LP from the brand new industrial metal band (IT). The trio was originally formed in 2012 and has recorded an EP, which contained remixex of 4 epic horror movies themes like The Crow. I played the first song. My head nearly exploded! 'Blackheart' intro reminds me of a scene from 'Interview with the Vampire', where Lestat plays a harpsichord etude. My peaceful vision was disturbed by the powerful beat and distorted guitars. Then vocals has come – warm female voice with accompaniment of keyboard and male back vocals as deep as the one from Deathstars. Female tracks and the male one create a wonderful harmony. Quietly spoken verses are a prelude to the true vocalist's power, which is presented during chorus and the bridge. I haven't been so surprised for a long time. Dark independent scene definitely needs musicians like Deuxvolt. 'Dance With Ghosts' begins with a Silent Hill like intro and then massive beat and guitars annihilates the reality. I can't hear anything besides Olimpia's voice. The one statement I can hear again and again is 'this is new war'. This powerful song takes the listener to the vampiric world as presented in 'Queen of the Damned' (soundtrack by J. Davis of Korn). Listening to the psychodellic sounds I can clearly imagine a future war front-line. Sudden silence stops the war. Futuristic synths starts the next track called 'From The Stars'. It's an announcement to the longest journey. The countdown starts. Fast, sometimes asynchronous beat and distortions provide the anxious atmosphere. Olimpia and her colleague start their universal story. Background is dominated by distorted synths and ambient sounds. Guitar section creates an illusion of a hyperspace travel. Female vocals are drowned by male shouts. Has something gone wrong? The listener can almost feel the anxiety. The vocals from the beginning takes him back on Earth. The result of a hyperspace journey failure may be loss of the soul, which is reminded by the next song. Vocals are almost the same as in Eyes Set To Kill. They're also strongly dominated by a male section. The track is full of positive energy. Background synth-cymbals solo drills in memory. When it comes again I can feel shivers all over my body. I could 'Lose My Soul' for such a great composition. With the song 'Goth' comes oblivion. Fast guitars and vampiric beat put into a trance. I feel like I am at the Deathstars performance featuring Alexia Rodriguez. Powerful beat makes me hit the floor. True power of the vocals comes at the solo part. It's a really breath-taking section. Will I regain my breath after the 'Breathless'? The track begins with an angels choir and then comes guitars and hard beats. Composition is perfect. Passion of the voice sounds like Emilie Autumn in 'Opheliac'. Whether is it an advantage or not - judge it yourself during this feast of senses. 'God Of Himself' is a different story. Characteristic sound for this composition are: massive industrial beat, strange keyboards and totally distorted guitars. Interrupted radio announcements make a horrific atmosphere. The inspiration with Deathstars is very strong, fortunately I love 'em. Some influences are very recognizable. On the other hand it makes listener feel comfortable. Lestat's triumph increases in the 'Evampire'. Intro is another harpsichord etude. E-vamp is a great track that will find a lot of popularity nowadays. However the vocals doesn't suit the genre and choral sections don’t fit at all. Soft harpsichord background reminds me again of Emilie Autumn. I highly recommend this song to all the vampire stories lovers. There comes time for a battle between man and devil. Introduction suggests that the action takes place on Earth – the Devil comes to win. Quiet overdriven voice definitely fits the character of the divine exile. Bridge part is accompanied by the piano and strong beat – as usual. This composition makes an interesting contrast, but isn't truly admirable. 'Dies Irae' is an industrial rave like track the conception of which is totally different than the others. Fast multi-track beat creates a rather lame background for an organ and vocals performance. I'm not particularly impressed. This experiment has made a monster. Dear musicians, please don't do it again... It can cause a damage of terminal disability! The last track – 'Beyond The End' takes us again to the world of the harpsichord-playing bloodsucker who loves delightful melodies. Guitar solo is a fabulous background for the opera vocals. Honestly, it reminds me a theme from a vamp-anime like 'The Vampire Hunter D'. Just like in 'Evampire' the influence of Emilie is so strong. You can realize that by listening carefully to Olimpia's whining. After listening to the whole album all I can say is that the trio did a great job! I can hardly remember a band like Deuxvolt on the young dark independent scene. A strong female voice with a pleasant accompaniment is a highly desired thing. It's such a pity that sometimes it's dominated by too strong beats. I hope that the next LP will be enriched with some guitar solos and improved beats. Deuxvolt has a chance of development for the independent scene.